Bryn Myrddin is Welsh for Merlin’s Hill. Our cottage is named for the local landmark and legendary wizard, and celebrates the link between Carmarthen and Merlin. 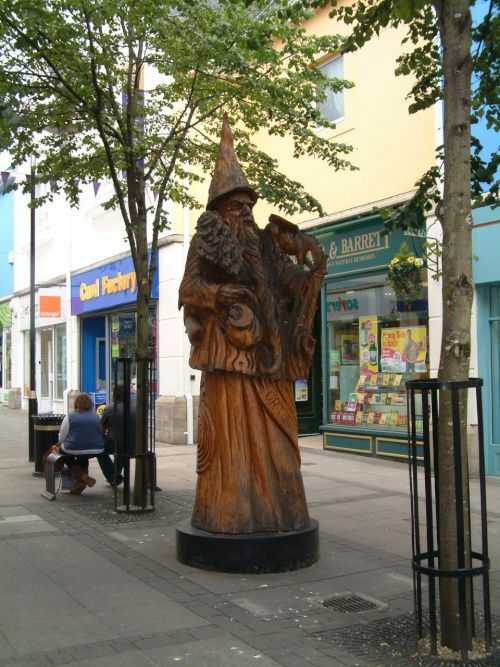 In the town you will find many references to Merlin, and indeed, a splendid wooden statue of him in the shopping precinct called Merlin’s Walk. Merlin is an enduring legend from pre-history and a great deal has been written about the wizard and his times, notably Geoffrey of Monmouth’s The Life of Merlin in 1150. He was born in Carmarthen around AD 400, and was originally named Emrys, or Ambrosius. He later became known as Merlin which is taken from the Welsh name for his birthplace, Gaerfyrddin. This extract is from David Nash Ford’s Early British Kingdoms. Bryn Myrddin or “Merlin’s Hill” stands alongside the A40, two and half miles up the Tywi Valley from Carmarthen in South Wales. 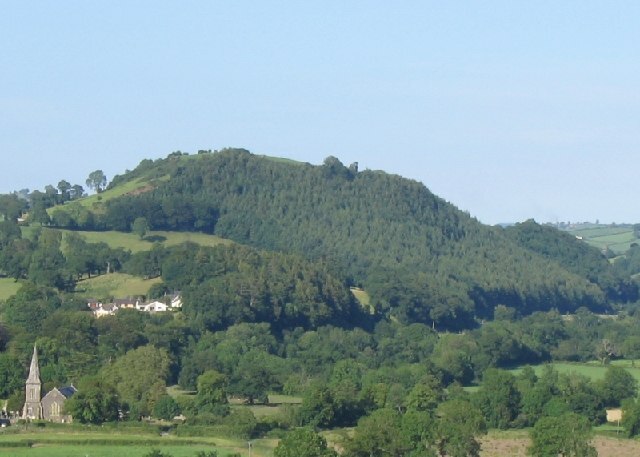 You can enjoy walks around the ancient hillfort and learn about the history of the area as well as the workings of a Welsh hill farm at the ‘Merlin Centre’ on its upper slopes. This is one of the supposed scenes of the imprisonment of King Arthur’s great advisor, Merlin the Magician, by his lover, the Lady of the Lake. Having taught the lady everything he knew about the mystic arts, poor Merlin had served his purpose and wicked water-nymph turned on him. She used her new-found powers to magically enclose him in a cave beneath the hillside. He lives there still, and if you can find the place where the cave-wall is thinnest, you will hear his subterranean groans. Adjoining the hill is Merlin’s Wood and, across the road, is Cerrig Fyrddin or “Merlin’s Stone”. This was said to mark where Merlin had hidden his vast store of treasure. Hence there have been many treasure hunters. The stone once fell on one and crushed him to death. Thus fulfilling an old prophesy that a raven would drink a man’s blood off the Merlin’s Stone. The statue of Merlin in Carmarthen, and Merlin’s Hill in the Tywi Valley.